How Much Does a Tyre Inspection Cost? The tyres on your vehicle are the main contact between you and the road but is one of the most overlooked parts when it comes to vehicle maintenance. Tyres wear down over time but other problems with your vehicle may cause them to wear out faster or wear unevenly - costing you more money. Having your tyres inspected regularly will ensure that your vehicle is safe both for your family and other motorists. Tyres are made up of a rubber carcass built around steel belts, with the tread layered on top. They have an airtight bead which seals to the inside of the rim they are fitted to, which allows them to be airtight and maintain pressure and inflation. The four tyres provide the only contact between your vehicle and the road and work with the suspension and steering components to provide stable and secure handling. One of the most common reasons that tyres wear unevenly is incorrect tyre pressure. Over or under inflating your tyres can have drastic effects on both wear rate and how your vehicle handles. Over inflation of tyres causes the middle of the tyre to wear out faster, and will make the ride more uncomfortable as the tyre will not absorb much of the shock from bumps in the road. Under inflation causes the shoulders of the tyre to wear quicker, and will also affect the handling characteristics of the vehicle. Hitting potholes at speed, running over debris on the road or running into curbs or gutters can all cause irreparable damage to your tyres. If your tyres are damaged and you continue to drive on them, they may fail and cause an accident. Having your tyres inspected at regular intervals, or after an impact, will ensure your tyres are safe to drive on. If your tyres are wearing unevenly, and the pressures are good, it may indicate that there is a problem with your vehicles alignment settings. Manufacturers have specific alignment settings and if your vehicle is not adjusted back to these settings regularly, it may affect the handling and life of the tyres. It could also indicate a problem with the suspension system of your vehicle. It is normal for tyres to wear down over time and it may just be that you are due to have them replaced. If the tread is worn down below a certain level (legal limit in most states is 1.5mm) it is time to have your tyres replaced. If there is no tread left, or you see wires hanging from your tyres, it is time to replace them as soon as possible. How is a Tyre Inspection carried out? Our mechanics will inspect your tyres for tread depth, proper inflation, and check for any damage to the sidewall or tread – including punctures. The wheels will be inspected for any damage and they will also inspect the suspension system for wear. The car will be road tested to check how the vehicle tracks on the road and to ensure the vehicles steering wheel and alignment is centered. 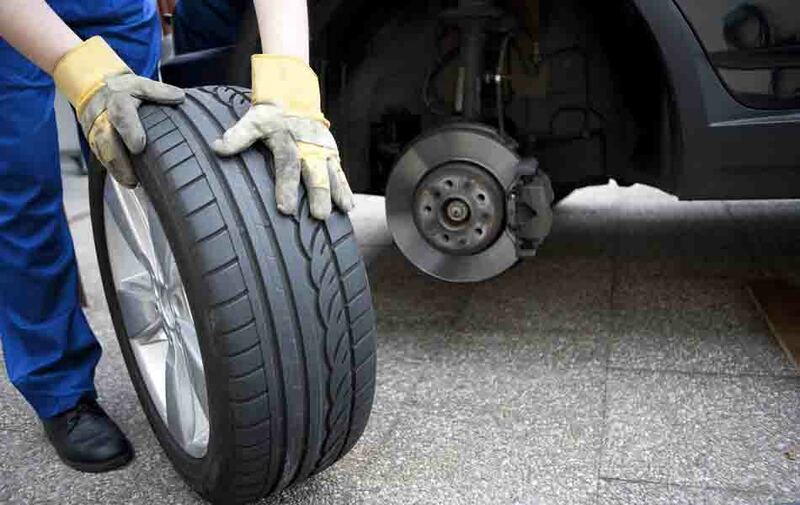 Having your tyres inspected and your suspension checked will ensure that your vehicle is in a safe condition for both you, your family, and other motorists on the road. Driving a vehicle with tyres that are below the legal limit, or that have damage, can have adverse effects on the handling and stopping distance which may be the difference between having or avoiding an accident, especially in wet weather conditions.